NOW the king, having been fully instructed by the man of God in the doctrines of the Gospel, and confirmed in his faith by this miracle, sped on his way, nothing doubting, and with zeal equalling the rapidity of his travel, made haste to see the pious Archbishop Remedius, that, with the Holy Spirit working by his agency, he might be washed in the living fountain of Catholic baptism to the remission of his sins and the hope of everlasting life. 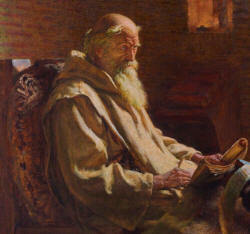 With whom having remained a few days, to satisfy the requirements of the church, and according to the apostolic precept to wash himself beforehand in the tears of repentance, as St. Paul, the chief of the Apostles, says, “Be repentant, and let each of you be baptized in the name of our Lord Jesus Christ;” and that after this he might receive the mystery of baptism in the name of the Holy Trinity. But the holy pontiff knowing how St. Paul says, “Let all your deeds be done in good order,” appointed a day on which the king should enter the church, and receive the sacrament of Divine Love. What joy was there among God’s saints, what triumph in the church of God, when they saw that the king of Nineveh, at the preaching of Jonah, had descended from his throne and sat in the ashes of repentance, and humbled the head of his majesty under the pious hand of God’s priest. The king, therefore, was baptized, together with his nobles and people, who, by Divine grace preventing them, rejoiced to receive the sacrament of the holy laver. With both his objects gained, namely, the conquest of his enemies and the fulfilment of his own salvatory vow, he returned to sway the sceptre of his kingdom, and commended St. Vedast to the holy Archbishop Remedius. Here he stayed, and acquired renown by the merits of his life and the example of virtue which he set. He was amiable and respected by all, for the religious dignity of his manners, his singular charity, his delightful brotherly love, the distinguished humility of his piety, his constant watchfulness in prayer, his modesty of language, his chastity of body, his sobriety in fasting, and the kind way in which he comforted the wretched. He never thought of the morrow, but trusting continually in the bounty of God, fed all who came to him with the bread of eternal life. He despised no one in narrow circumstances, but refreshed the sorrowful with the words of pious consolation; he injured no one, not even by a word; but deemed it sufficient to benefit all with brotherly love; wherefore, also, he was much frequented by many illustrious men, that by his most holy discourse they might receive consolation for any sorrows that afflicted them, or hear from him the pure truths of religion according to the practice of the church. Wherefore, also, many were rescued by his devout piety from the snares of the Devil, and with the aid of divine love entered on the road that leads to everlasting life.